The Challenge Spartan 150A and 150SA paper cutters are sleek, strong, 15″ table-top machines perfect for the professional office, copy center, in-plant, and on-demand printing environments. The Spartan 150A and 150SA are engineered and manufactured to the highest safety standards available. Shields cover the front and rear tables for optimal safety for its users, and the front-side cut buttons require two hands to simultaneously activate the cut cycle which eliminates the possibility of errors. The Spartan Model 150A offers an automatic power clamp, whereas the Spartan Model 150SA offers a manual hand-wheel clamp. 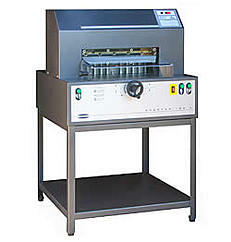 This tough power cutting machine offers a 1/2 HP gear drive motor to power through up to a 1-1/2″ thick stack of paper. The Spartan 150A & 150SA Electric Paper Cutters are made of heavy duty steel, cast iron, and cast aluminum construction for a long life. The maximum cutting width for both electric paper cutters is 15-3/4”, while the minimum cut is 1-15/16”. In front of the blade the table length is 9”. These machines can power through a stack of paper as thick as 1-1/2” in just 2 seconds. The LED Digital Backgauge Position Display, makes it easy to read the digital display located on the front table of the machine that allowing the operator to easily set the back gauge position accurately, every time. Twelve red LED lights positioned over the knife provide the brightest, most consistent and easy to see optical cut-line in the industry, so you can align your sheets perfectly for the optimum cut. Both Spartan 150 Electric Cutters come standard with two high speed steel knives, three plastic cutting sticks, one jogging aid, one tool kit, one knife change safety holder assembly and one user manual. They measure 25-3/4” wide x 31” deep x 21-1/2” high without the optional stand, and weigh 190 pounds. We recommend placing the cutters on mobile workstations because of the large size of the unit. If you have any questions or are interested in purchasing the 150-A or 150-SA Electric Paper Cutters, visit us at SpiralBinding.com. We have great pricing on a full line of Electric Paper Cutters. Call us at 1-800-631-3572 for more information!